There is nothing of greater importance in our life then our relationships and few things charged with more emotion and personal history. Shocking but true, our relationships are always a work in progress and we are, too. While we are meant to enjoy our beloveds when life goes smoothly, it’s truly the tough times-the moments that pinch that provide us with our opportunity for conscious growth. Most of us however miss that opportunity during moments of conflict as we get trapped in our feelings and negative thoughts and spiral into the distraction of creating more chaos. How many times have difficult conversations with your partner led you into a highly charged negative state? Have you found yourself irritated with your children when you feel unappreciated? Do you find yourself resentful of your siblings as old stories play repeatedly in your over active mind? When relationships are not going well, we often blame someone else. Pointing the finger at others, feels totally seductive and may leave you feeling as if you don’t have any other choice. But the truth is that you do and when you give into the temptation to lash out, you lose the opportunity for the growth that awaits. Whether you wish to mend family ties, friendships, business alliances, or your relationship with you…there is a spiritual solution. The practice that I’m about to provide for you will enable you to begin to create a new level of neutrality around highly charged relationships. When you use this practice you will work from the high frequency vibration of love and will transform your vibration when you find yourself negatively charged. 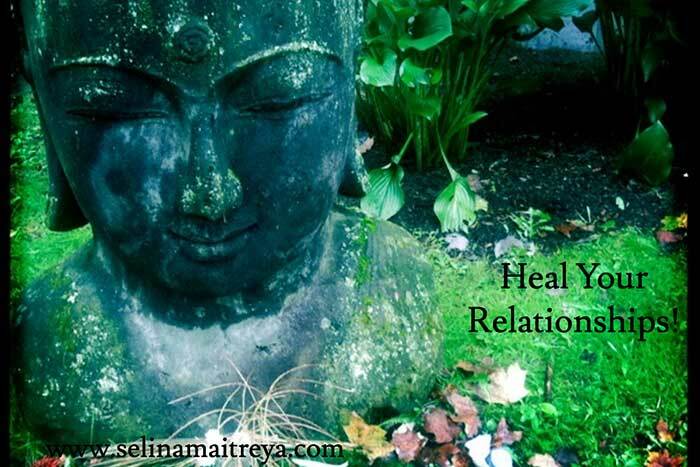 When you use the practice below you can heal your relationships and grow your consciousness all at once! Feelings generate vibration, vibration dictates our actions. When your emotions are negatively activated they generate a vibration, and that vibration dictates your actions. When you respond with a positive, loving vibration you create a different action. That’s why you may start out calmly speaking to your co-worker about cleaning the common area more frequently, and you feel that they’re not listening, and your irritation rises and within seconds you feel that it’s almost impossible to contain your anger and you snap back. The vibration of your frustration dictated your actions. While it may seem that your emotional responses are not helpful, they can actually be you’re most accessible tool to healing any relationship. All difficulty is an opportunity for us to remember who we are. We are love, and difficult relationships can be your gift to shift into the frequency of love. But you need to use them as such in order for them to be of use to you. Here’s a practice that can help you to turn a difficult time with a beloved into the high frequency of love. Practice it before you need it and you’ll be ready when the need arises. You’ll need a bit of privacy and about 10minutes or less. Close your eyes take a breath, blow out the air forcefully. Take 2 more breaths and then breathe normally keeping your attention on the rise and fall of your chest. Now, engage your imagination. Visualize a time in the recent past where you had a difficult conversation or angry moments with someone you care greatly for. Allow yourself to see all the details of the situation. Hear the words that were said. Experience the feelings and hold them in your body. Allow yourself to feel them deeply. Now take 2 cleansing breaths; deep inhale and full exhale. Ask the universe, what face of love was I to give to this person? Was it patience, or kindness, or Grace, was it understanding, or tolerance? Allow the answer to enter your consciousness, just let it land there. Now, take a moment and remember a time that someone gave you the face of love suggested by Spirit. Feel it completely in your body. Fill yourself with the energy of love that was given to you. Now in your imagination, see the person that you are to gift with this frequency. Look deeply into their eyes and share it with them. Now ask the universe, what face of love am I to give myself? Is it compassion, patience or understanding? Once again, wait for the response and trust whatever comes through. Take a moment and remember a time that someone gave you that face of love. Feel it once again, fully in your body. Fill your being with this frequency. Now, take a deep breath and come back into the room. This practice usually takes 5-10 minutes from start to finish. When most people go through this practice they report that they come out no longer emotionally charged from the original event, in fact they are now experiencing deeply the compassion, the patience, the tolerance that they were directed to fill themselves with. How can your state change so quickly? How we feel, our state, is a frequency. In this practice you are going from a low frequency vibration and then choosing to shift into a high vibrational mode. That happens as quickly as turning on a switch in dark room. One minute there is darkness and the next minute light! Please remember that what we call our emotions are actually energetic fields running through our body. You can indeed learn how to recognize them and shift them at will. In the beginning you may be working with them after an event has occurred. But if you use this practice often, you will find yourself being able to remember in a moment of emotional charge that you have choice and you will be able to switch your frequency at will! Is that work? You bet it is. But this is true power. This is how you spiritually can heal your relationships! We’ll set up a time to talk on Skype or the phone and we will discuss where you are on your path, and how the tools of practical spirituality can support you in your quest to live a more conscious life. I look forward to hearing from you! 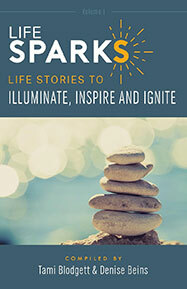 LIFESPARKS is a deeply inspirational and moving book that contains stories of triumph over adversity. I'm honored to have my story "Who Knew" included. For the first time, I publicly share my experience of having my entire life completely turned upside down in the blink of an eye. On the day that I was to start my new life, a car event left me with a major brain injury and my new life began. To read my story and inspirational writing from others who turned adversity into blessing check out LIFESPARKS below.